Isaac was Abraham's proper heir, and as such, he inherited Abraham's territory that extended north-south from Hebron to Beersheba. That territory was entirely in the region that the Bible calls "Edom." Edom was under the control of Horite ruler-priests. The Edomite rulers are listed in Genesis 36. Jews call their ancestors "Horim," which is a variant of Horite. 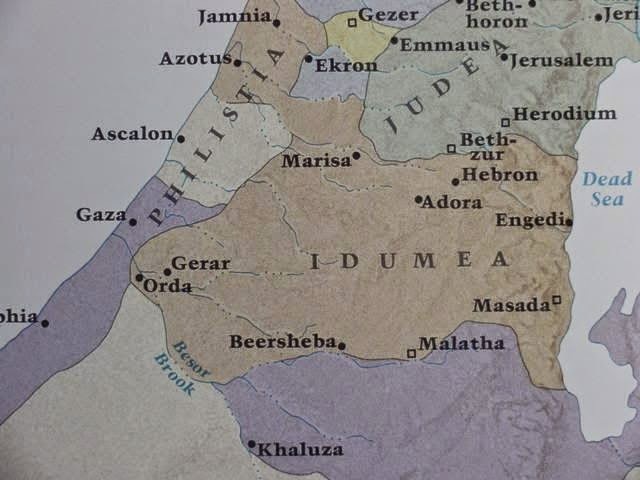 Both Hebron (where Sarah lived) and Beersheba (where Keturah lived) are in Edom (Idumea in Greek). Abraham's territory extended between the settlements of his two wives, and included mountains and lowlands. This passage from Genesis 26 speaks of Isaac's great wealth and conveys the idea that his prosperity came as divine blessing. There is little doubt that Isaac was more prosperous even than Abraham as he received a territory from his father and apparently was able to make this land productive. Isaac kept herds of cattle on the lowlands and flocks of sheep on the hillsides. He "reopened the wells that had been dug in the time of his father Abraham, which the Philistines had stopped up after Abraham died, and he gave them the same names his father had given them" (Gen. 26:18). Wells were essential to his herds and flocks for by Isaac's time (c. 1987-1888 B.C.) Edom was more arid. Abraham dug wells in the area of Gerar, on the western side of his territory (Gen. 20:1). The wells were dug by hand through solid limestone. Often steps were carved in the limestone and the people went into the well with their containers. Some wells required ropes and water skins to draw out the water. Only the wealthy owned wells. Abraham's wealth was passed to Isaac. Beer-Sheba means the well of Sheba. Keturah, Abraham's cousin bride, was of the noble house of Sheba. Many Horite rulers met their wives at wells. Genesis 10:13, 14 names the Philistines and the Caphtorim as descendants of Mizraim, which is Egypt. There is no doubt that these coastline peoples were culturally Egyptian (as was the island of Tyre in the time of David). The Philistines occupied territory on the Mediterranean coast. Their northern boundary reached to the border of Ekron, and their southwestern limit was the brook of Egypt (Wadi al-'Arish), as described in Joshua 13. Their territory was a wide, fertile plain bordering the Judean hills and Edom. This was very productive land. Genesis 26 tells us that Isaac's territory was so prosperous that the Philistines envied him. The Philistines are linked to the "sea peoples." The sea peoples included peoples from Libya, the islands of the Mediterranean, and contiguous lands. Scholars have identified at least nine people groups as "sea people." 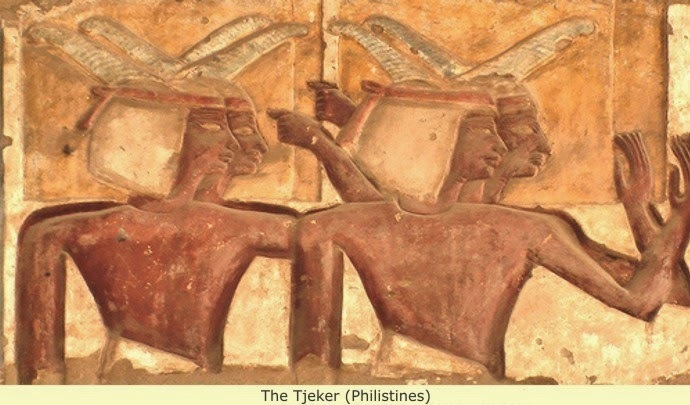 The Denyen; the Ekwesh; the Antaolian Lukka; the Peleset, the Shekelesh; the Sherden; the Teresh, (ancestors of the Etruscans); the Tjeker; and the Weshesh. These people were not called "Philistines" during Isaac time. Their packs were untied, thrown away. He had no drinking water to sustain him. All his goods were food for the troops. Since 1873, based on etymological evidence, the Philistines and the Peleset they have been connected with the Aegean "Pelasgians." This identification is held by many Egyptologists and archaeologists. Israel Finkelstein maintains that archaeological research to date has not corroborated a mass settlement of Philistines during the Ramesses III era (c. 1187-1064 B.C. ), about seven hundred years after Isaac. In Isaac's time there were many "sea peoples" but probably not a ethnic group known as "Philistines." This term is likely an anachronism and comes from a time later than Isaac. The Edomite rulers are of the House of Seir the Horite. Seir's daughter Timnah married Esau the Elder. This is not Jacob's brother. According to Genesis 25, Esau presented first in the birth. This chapter also tells us that Esau the Younger and Jacob represent two nations. This is analogous to the story of Joktan and Peleg, also brothers, in whose time the peoples/earth divided into Afro-Arabians (Joktan/Yaqtan) and Afro-Asiatic Aramaens (Peleg). You are quite right that some of Jacob's kinsmen never went into Egypt. It also appears that some of Jacob's sons went freely in and out of Egypt, as was the case with Judah, who impregnated Tamar in the metal-working area of Timnah.